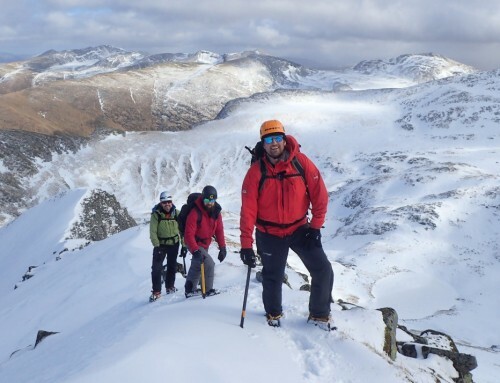 Home/Rob Johnsons Blog/Ideas for this weekend in Snowdonia – winter fun! 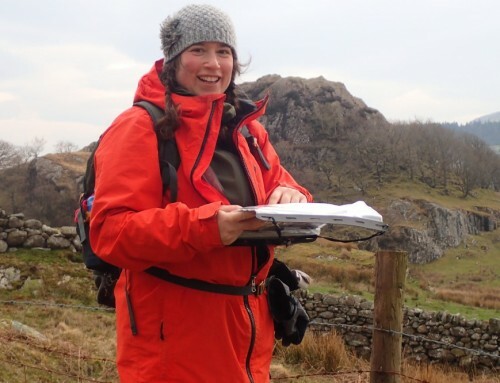 Whilst these blanket statements serve as a useful warning that a hazard exists, they are not great at helping plan a fun and enjoyable weekend in the snowy mountains here in North Wales and so I thought I would give some pointers. First a caveat. The mountains in winter are much more serious than summer. 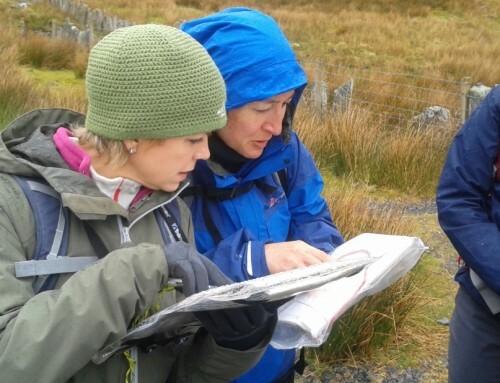 You need to be able to navigate properly with a map and compass if you are to avoid serious hazards in poor weather conditions and poor visibility. The consequences of a slip are much more serious and hence the use of axe and crampons. You get cold and wet much quicker so you need plenty of layers and some emergency shelter. Cornices represent a hazard as something you can fall through. There is a risk of avalanche in winter. 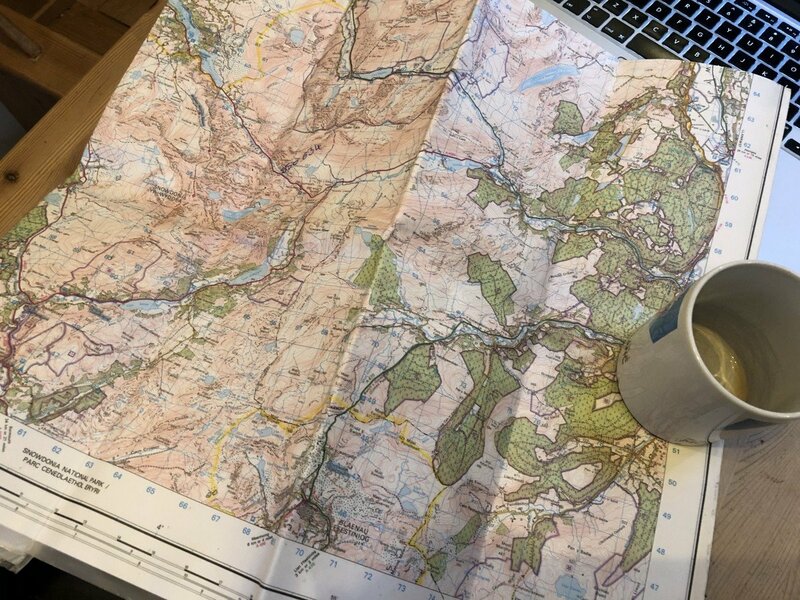 Winter planning starts at home with a map and a brew. I assume that because you are reading this you are a grown up and you are happy with the above. You go out in the mountains at your own risk and you enjoy the challenge, thats certainly how I feel. Moel Siabod – go up and down from Plas y Brenin (Northern slops) and you will be on gentle slopes that have been scoured by the winds and so represent little in the way of avalanche hazard. If you get gaps in the clouds you will also enjoy some stunning views of most of the National Park. Glyder Fach and Glyder Fair via Y Foel Goch. If you start at Capel Curig you will get a good walk onto the high tops and be able to avoid any steep slopes that might represent an avalanche risk. 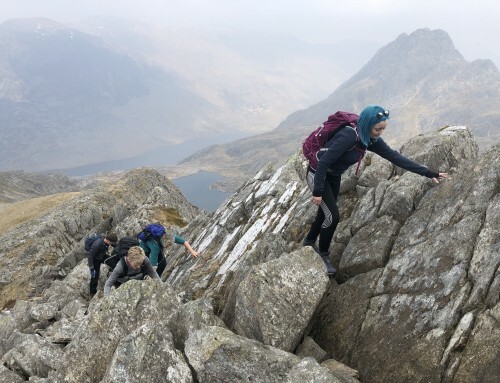 You need to be good with your navigation though – in poor visibility the Glyderau plateau can be confusing and cornices could be present at the top of steep slopes. The Northern Carneddau. Park at Abergwyngregyn and head up onto Drum or further up onto Foel Grach. This will give a longer day out but will take you onto some beautifully wild terrain, again avoiding steep slopes. This is not meant to be a definitive list – there are many more enjoyable options available. I am keen to provide some suggestions to counter the idea that the mountains are “out of bounds” this weekend. I generally avoid posts like this as they feel like an enormous weight of responsibility – I would much rather tell people what conditions I find when I am out and then let people make their own decisions – but the negative press about something I love so much means I am making an exception. Edit: Ice is now climbable in the high Cwms – see our post from Friday 1st Feb.
Basically stick to ridges! For all of these choose your descent carefully based on the paragraphs below. Because of the avalanche risk, good visibility and route selection are important especially in steep locations. Careful group management and good spacing will reduce loading on slopes. Use mountain features (ridges and scoured slopes etc) to travel safely. If you want to keep things simple stay out of the gullies this weekend. That includes avoiding routes like the easy lines on the Trinity Face on Snowdon. (There was an avalanche here on Tuesday). Choose wind scoured slopes for descent. Edit: 1st Feb – The wind has been moving the snow around a lot since yesterday so that the wind scoured slopes are now very obvious as long as you have good visibility. 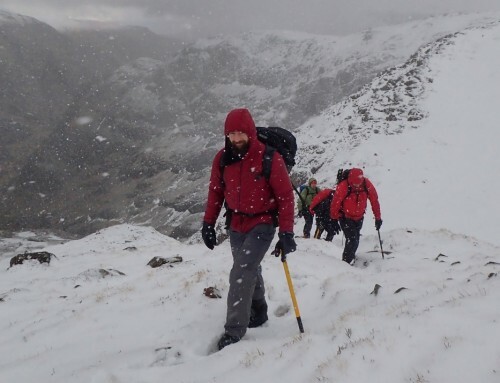 Climbers have been in the gullies but are using a level of avalanche awareness to avoid and manage the risk – to do this you need good visibility and the skills to recognise the hazards. For useful educational information on avalanche avoidance have a look at the Scottish Avalanche Information Service education pages. These pages will explain how the wind creates the avalanche hazard and will also explain what we mean by steep slopes. The Mountains are not Closed! Snowdonia’s mountains are open this weekend! The mountains are free for all to enjoy and offer a fantastic natural resource for the whole of our society. They bring many health benefits, both physically and psychologically and for me they have shaped my whole life. There is a very real risk to this freedom when the uninformed press starts discussing the dangers of the winter mountains without understanding the many benefits to society as a whole. The mountains offer an environment where we can be responsible for ourselves, we can learn to manage risk and we put up with the consequences. This is beautifully described by the BMC in an article released this week in reaction to the SNPA statement. The mountains in winter are wonderful, I hope you have a fantastic weekend and stay safe.